Dan Berrigan is dead at 94. A Jesuit priest and poet whose defiant protests helped to shape the tactics of opposition to the Vietnam War and landed him in prison. Along with his brother Philip (also a priest) a defining point was the public burning of Selective Service draft records in Catonsville, Md. Their action inspired protests, marches, sit ins, the public burning of draft records and other acts of civil disobedience across the nation. 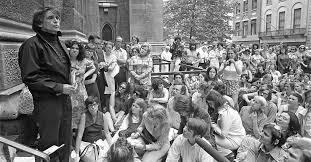 In 1980 Daniel Berrigan was again arrested for taking part in the Plowshares raid on a General Electric missile plant in King of Prussian, Pa. Here Daniel and Philip and others rained hammer blows on missile warheads. They then poured a vile of their blood on the nosecones and waited to be arrested. In 2006 Daniel was again arrested for blocking the entrance to another nuclear missile facility. This is but a sample of their willingness to pay a price for their beliefs. The witness of the Berrigan brothers fueled debates around kitchen tables and in houses of worship. My politically conservative Dad argued with our pastor, Fred Buker about the Vietnam War. Fred was a veteran who had become a critic. The witness of the Berrigan’s angered my Dad and inspired our pastor. Such is the work of a prophet. Dan and Philip Berrigan’s activism was rooted in the pages of Scripture as it was for Dorothy Day, Martin Luther King Jr. and obscure figures like my childhood pastor. The words of Scripture, when taken to heart, have the ability to transform the hearer. To take us from selfishness to selflessness, from war mongering to peace, from fear to hope. 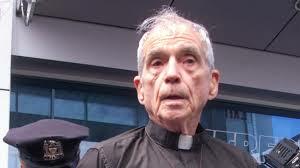 Daniel Berrigan inspired and offended many within and beyond his Roman Catholic tradition. He inspired and at times pissed us off. Such is the work of a prophet. Heroes come and go. The words of faith remain. Who among us will give voice to these ancient words? Who will take up the mantle of a prophet? Courage is to be admired, even when one disagrees. There are courageous women and men out there every day doing their good work. How do we tell their story? What does it look like for you and me to be courageous? Well said, as usual. Unfortunately, there will also be false prophets among us whose greatest claim to injustice is an insipid cry of “unfair!” because divergent voices are allowed at the ecclesiastical table (a biblical idea in itself). Those ones will join in the strident opposition of prophets like Berrigan and be the first in line to promote a crucifixion. Sound familiar?